Magazines are a pretty straightforward thing to organize. Most of them have a date somewhere on the cover. Arrange them by date. Arrange different magazines by subject, or alphabetically. Done. 1) People rarely have time to read them in the first place. 2) People read them and want to save a particular article, but never make note of it. 3) People make note of an interesting article, but never go back and read it again. Ever. 4) People basically almost never re-read their magazines. 5) If magazines aren't stored accessibly (i.e. on shelves), your chances of actually re-reading them are even slimmer. 6) Magazines can take up a lot of room. 7) Magazines seem to like to live in piles. 8) Piles of magazines seem to like to topple over at inopportune moments. It's time to get real with yourself. Are you honest about your magazine habits? If you never have time to read your magazines, why do you buy so many? Could you buy fewer each month? If you realistically can't think of a way to make more time in your life to read two, five, or 10 magazines per month (don't laugh—I used to regularly buy about double that! ), consider going cold turkey for a while. There's an amazing book by Elaine St. James called Living the Simple Life: A Guide to Scaling Down and Enjoying More. In it St. James lists 10 ways to free up miscellaneous amounts of time in your life over the next thirty days, so that you can start thinking about how to simplify your life. Way number three is to stop reading magazines. Let's say you don't want to stop reading magazines. Can you at least get rid of them once you're done with them? Recycle them, or donate them to a local women's shelter, health care practitioner's office or hospital waiting room. Or pass them along to friends with similar interests. Or donate them to schools for art projects. If you can't get rid of them, can you only keep the ones you really love—and have space for? I was serious when I said that most people don't re-read their old magazines. That's a lot of dead (and heavy) energy sitting on your bookshelf. Not to mention the guilt of knowing that there are articles you'd like to read again, but you can't find them, and never have time to read them anyhow. That kind of guilt eats away at your peace of mind, and keeps you from enjoying the life you should be enjoying. I grew up in a house where my mom read a lot of magazines, and she kept all her back issues. When I was really young, the back issues lived in boxes in the basement. They were a treasure-trove of inspiration when I was about 12 years old, and discovered her Good Housekeeping magazines from the late 60s and early 70s (keep in mind I was born in '67, so it's not like they were even vintage by that point). I fell in love with the look of pastel-coloured babydoll dresses and kohl eyeliner, and was fascinated by the romance novels abridged within each issue. For a 12-year-old, the pack-rattiness of my mother's magazine habits was a boon. But for my mother—who didn't have a lot of storage space—the magazines became a burden. Eventually she threw them out. (I know, I know. People would probably pay good money for them today. Which reminds me—if you have truly vintage magazines, you can probably find a place to donate or sell them. Here in Toronto, I know a man with a costume warehouse who will take old clothing catalogues and clothing patterns, as well). My mom still buys magazines. And still has lots of back issues hanging around. At least now she usually gets rid of them when they're about a year old. As a teenager, I incessantly bought fashion magazines. And as I grew older, my interests broadened and I brought home a huger range of titles every month. When I was 26 I bought myself six IKEA Billy bookcases to store my collection of back issues (as well as my collection of books). When I ran out of shelf space, I started storing things (magazines, books) in boxes in the basement. I also collected old newspapers, by the way. For the photographs. I was an artist, and loved acquiring images of people, especially faces. My back issues and newspapers got out of hand. There were so many things I wanted to keep, but I didn't have space for them. I didn't want to throw them out, either. I liked to cut up magazines for collages—just think of all the raw material I would be losing if I got rid of everything! Eventually I realized that, even if I could find the time to go through all my back issues and newspapers and clip everything I wanted to save, it would take me years to get through all the boxes. And that wasn't how I wanted to spend my time. So I recycled most of it. And felt amazing afterwards. I still have magazines—approximately 32' of shelf space worth of them (including 30 years of National Geographics). But I do have space for them. And I actually use them. And I get rid of things when I run out of space and want to add new books or magazines. If you've read this far and you still want to keep your magazines, make sure you have room. You need proper bookcases or durable storage furniture. Magazines are heavy. 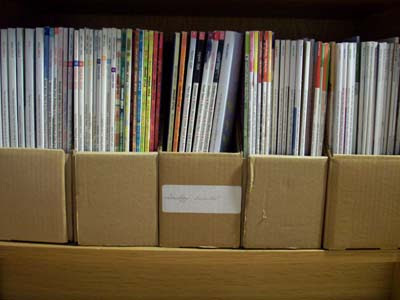 I recommend storing magazines vertically on shelves, in cardboard (or plastic) magazine holders. The holders make it easy to pull the magazines on and off the shelves without the other magazines slithering all over the place. When you run out of shelf space, don't add any new magazines unless you remove some old ones. And believe it or not, you may eventually decide that you don't really want to keep magazines anyhow. I’ve let go of a lot of titles that I would once never have parted with. And whenever I move again, I have a sneaking suspicion that most of the rest won’t make the cut. (Which reminds me of a funny story from my move last September. My boyfriend and his best friend were helping out, and when the best friend looked down at the labels on the three large boxes he was dollying to the elevator, he did a double-take.